Ah c'mon - that's not the kind of cardboard date that I'm talking about. I know you're probably all sick and tired of hearing about it my now, but my wife and I just got married a little over a week ago. Time and time again I'm reminded that it's a damn good thing I locked her down because she is probably the coolest life partner that a guy could ask for. After all, on one of our few and precious weekends where we are both off work and are otherwise unencumbered, not only did she allow me to sneak over to the card shop, she actually wanted to come with me. 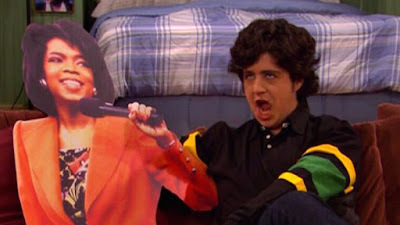 So, we had ourselves a little cardboard date. This is the kind of thing that I dreamed about, as a kid. Behold, me with my awkward T-Rex arm, opening the portal to the land of treasures - Baseball Dreams and Memories in Crestwood, IL. Of course, I allowed my wife to enter this cave of wonders first - chivalry ain't completely dead, after all. 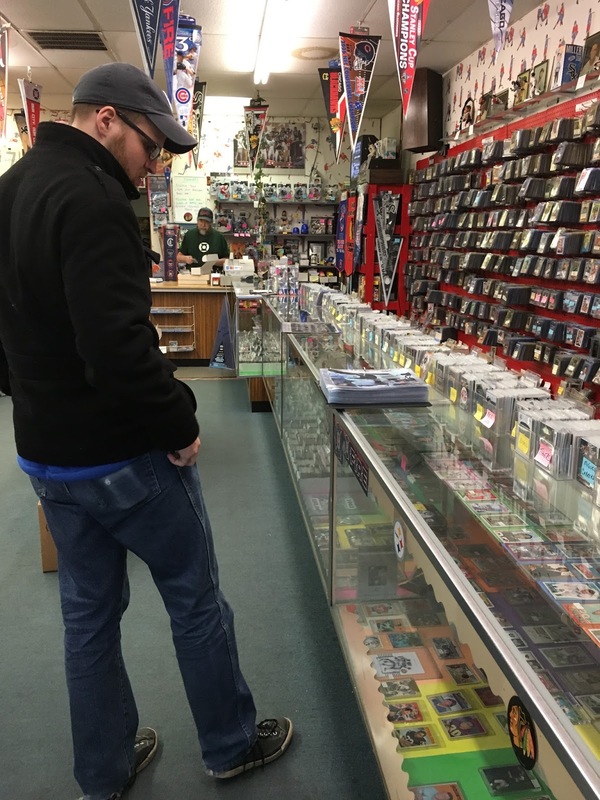 Here I am, in deep and total concentration, as I gaze into each glass case in search of new cardboard rectangles to add to my various collections. Also, apparently my wallet is about to burst out of my back pocket; I can say for certain that is not because it is fat with stacks of cash. Rather, I think it's time for me to start breaking in a new pair of blue jeans. The first round pick out of the 2014 draft has been something of a disappointment in his first year of NHL action - in 32 games played, the center has just 7 points an a +/- rating of -3. 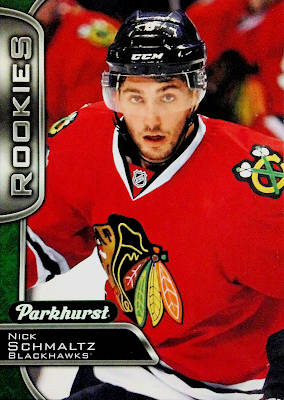 He's even been demoted to the AHL for a bit. However, you have to consider that the 20 year old was skating with the University of North Dakota last season; he's got plenty of time to develop. In fact, it wouldn't be hard to argue that he was brought up a touch too early. Regardless, I still needed a card of the rookie for my All-Time Blackhawks collection and this single from the Walmart exclusive 16-17 Parkurst release will fill Nick's slot quite nicely. 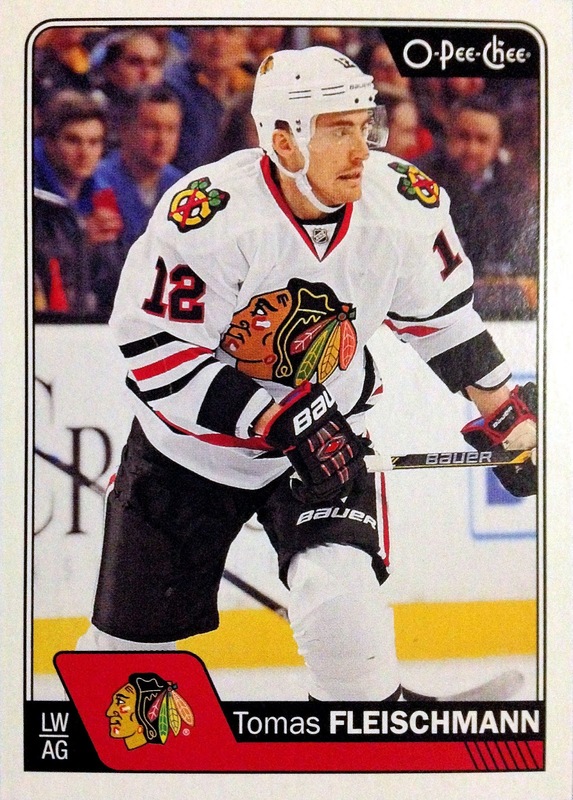 Now, I also need to track down the Tyler Motte rookie, for the very same purposes. 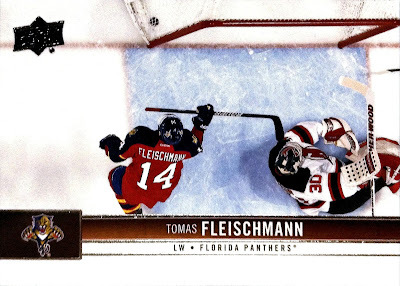 The only other card that I was able to track down during our little adventure was this 2016-17 O-Pee-Chee card of short-term Hawk, Tomas Fleischmann. The left winger was acquired prior to the trading deadline last season, along with Dale Weise, as reinforcement for their playoff run. Unfortunately, that trade didn't work out particularly well, as Tomas contributed just 5 points, along the way, before becoming a free agent. As of yet, he has yet to see further professional action. This Upper Deck single makes use of a phenomenal goal shot from Tomas' time with the Florida Panthers; nevertheless, Indian head sweaters will always take priority in my collection. Plus, I prefer to use cards where you can actually see the player's face. It makes sense - she's a huge fan of biting social commentary and plain, old fashioned, juvenile humor. 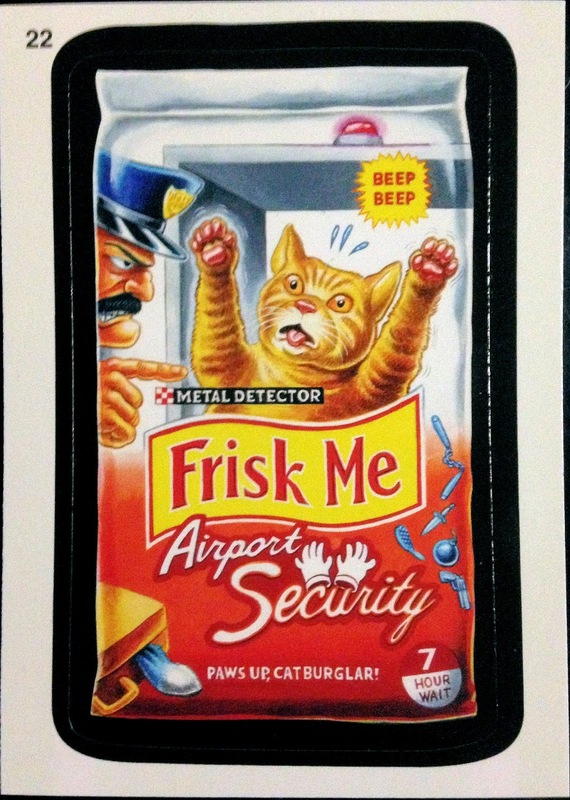 What other trading card products blend those two qualities as well as GPK and the Wackies? We both agree that the answer is none. 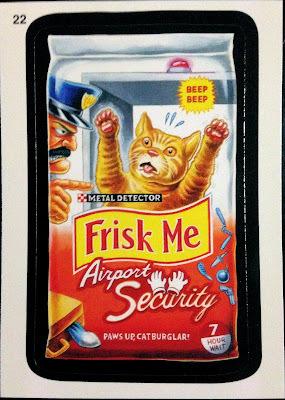 We also both agree that the "Frisk Me" airport security sticker on the left was the best of the bunch; even if it has taken on a whole new meaning. this weekend. 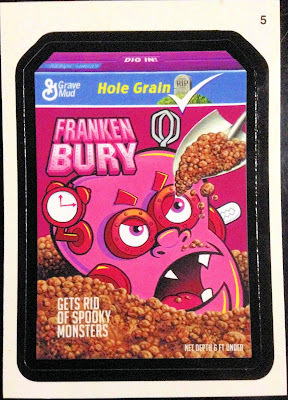 Meanwhile, the "Franken Bury" isn't particularly clever, but the strawberry, monster cereal is her very favorite breakfast treat. 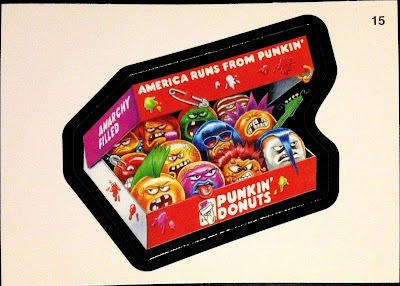 Some "Punkin' Donuts" to start your day off right - I especially enjoy the white pastry in the right front, sporting the Misfits' devilock, doing it's best Jerry Only impression. I think I can also spot of Joey Ramone look-a-like in there. Anywho, with as often as she runs to the real place for her morning coffee, I'm not surprised that she was attracted to this Dunkin parody. 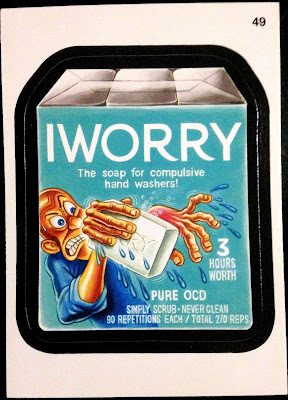 Apparently, my sister-in-law has a compulsive issue when it comes to washing her hands and is a borderline germaphobe. In all of the years I've known her, this is something that I was not aware of. But, my companion says it's true and that she bought the Wacky Pack on the left, just for her. 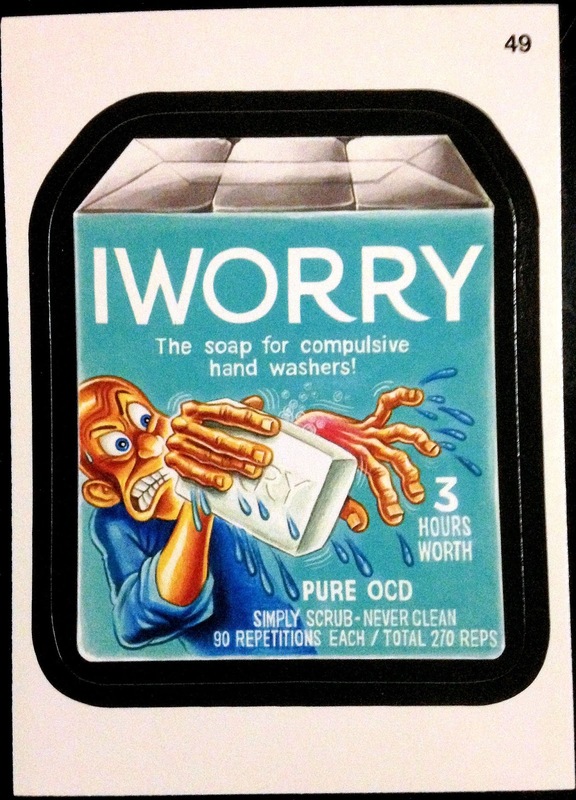 I wonder if I have to learn about the rest of my in-laws' quirks from old stickers? Lastly, we have the only Garbage Pail Kid of the bunch, Mr. Tommy Gun, which is fairly self-explanatory. 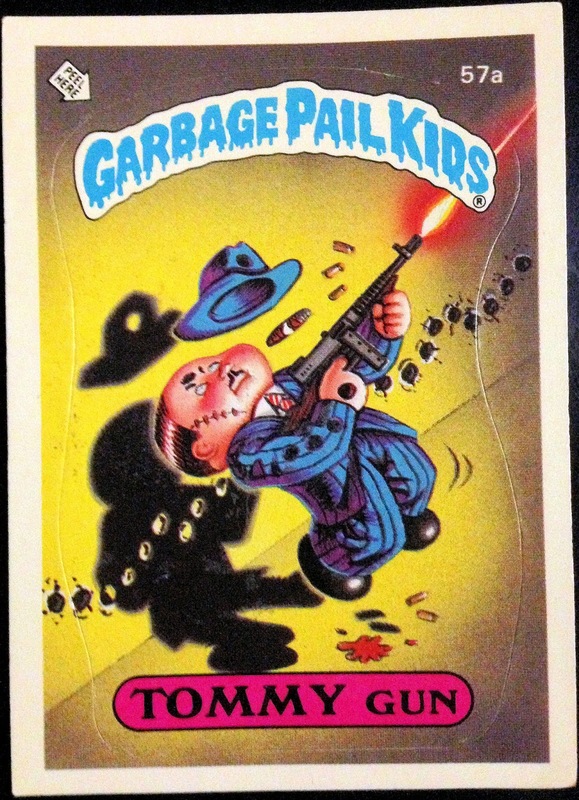 I guess it's only appropriate for a Chicago resident to have a card featuring a Capone era gangster. With that, we had finished exhausted our interests in the purveyors stock, so we payed the kind man and went about the rest of our day. Of course, we had to pose for a picture with our spoils, in the parking lot, before we could do anything else. Pics or it didn't happen, right? In short, let me just say that I can't believe how lucky I am that I found a partner in crime who not only supports my, admittedly, somewhat childish hobby, but openly partakes in it herself. Of course, that is just one in her long list of countless qualities that make her my favorite person in the world, but it's one that cannot be underestimated. Is anyone else out there lucky enough to share this hobby with their significant other? All I know that any day spent with my wife is a good day - add in a trip to the card shop and it instantly becomes a fantastically great, super awesome, fun day. My wife doesn't care for the cardboard rectangles. But she thinks it's a perfectly fine hobby for yours truly, which is better than nothing! 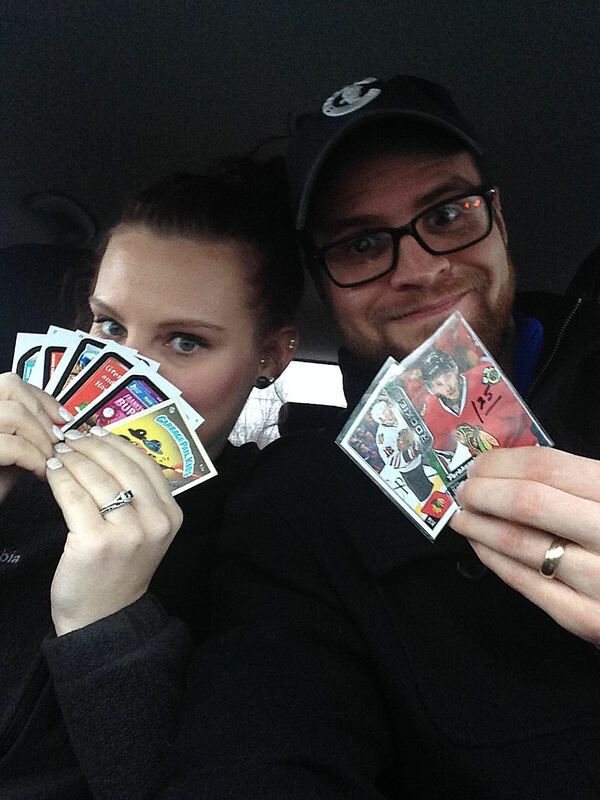 A wife who voluntarily accompanies you to the LCS? I think you picked a good one. I'll have to make it down to your neck of the woods one of these days and check out that card shop. A belated congrats on the marriage! 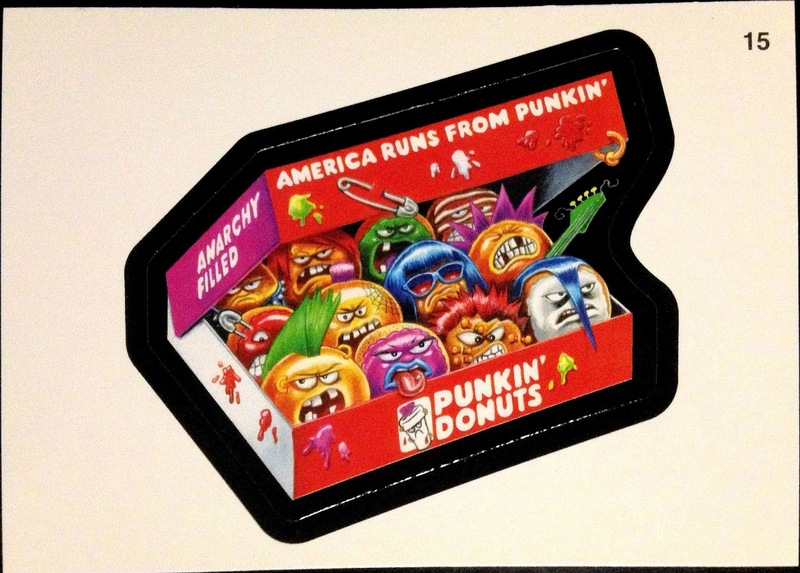 I particularly admire a woman who is into Wacky Packs (garbage pail kids? Meh). Nice pick-up there. 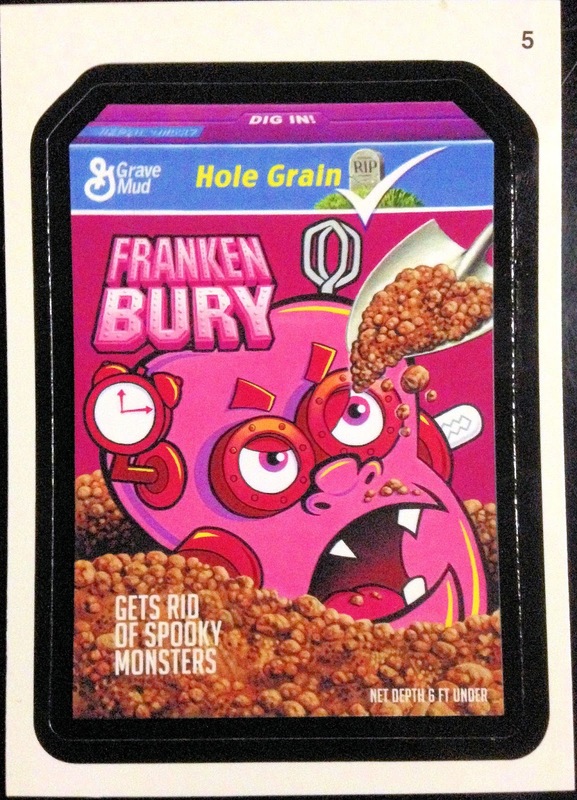 ;) My wife has zero interest in cardboard, although periodically I show her a card that she thinks is cool. Mine does not care for cards, but she also doesn't divorce me when bubble mailers arrive every other day. 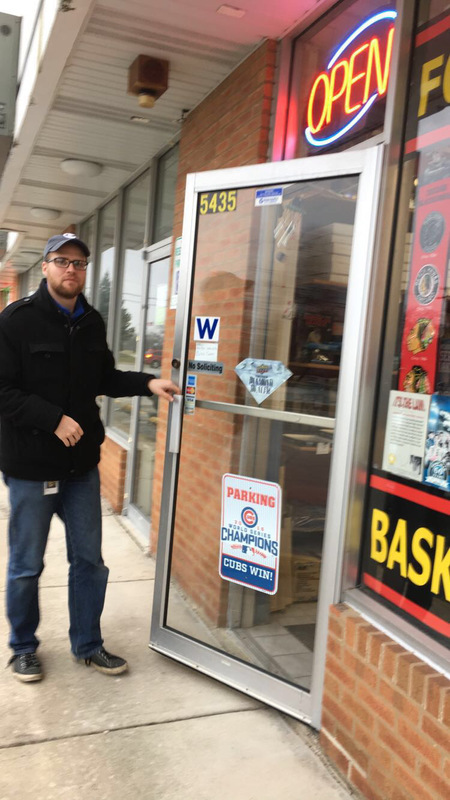 When did that shop open? Had to be in the mid-90's or so - I've been going there since 2003 and it was well-established at that time. Congratulations! You definitely hit the jackpot when you and your wife tied the knot. Me? Been single for two years straight... and have never married. I wonder why? Lol. Before I started collecting again in the 2000's, I actually kept my collecting a secret from girlfriends. However when I entered my 30's, I figured if a person truly loves you... they'll accept you for who you are and the hobbies you enjoy. During that time I've only had two girlfriends who were extra supportive of my hobby. I'm still best friends with one of them... and she'll hang out and watch me sort cards from time to time. Congrats again on the marriage. My wife stays away from the cardboard. Her only interest is seeing WVU guys get cards which she thinks is neat since we have such a connection with the university. Must be nice! 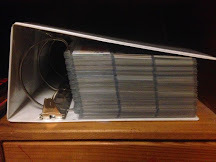 My wife doesn't care about cards at all. Occasionally I can sorta impress her with a card, like that Carrie Brownstein First Pitch insert I scored from the dimebox last weekend, since Sleater-Kinney is an all-time favorite band of hers. I almost thought about buying her a Parks & Rec hobby box a couple xmases ago, as she loves the show and I thought it might be a way to nudge her into collecting, but that would've been more for me, and as such not a good gift idea.